Slotland is making us an offer that's hard to refuse! 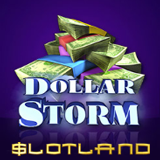 They've just launched their new Dollar Storm slot with its deal-or-no-deal bonus game and they'll give you a $15 freebie to try it! The symbols on the new Dollar Storm slot may be traditional fruits and bars. But, similar to the Top Dollar slot popular in Las Vegas casinos, its bonus game is like something right off television. Until September 18, the unique casino will give you a $15 freebie to try the new game. Introductory deposit bonuses with various wagering requirements are also available. Lightning Bolt scatters trigger the new game’s bonus features. One Lightning wins an up to 5X multiplier. Two bolts earns up to 7 Free Spins. Three or more trigger the Bonus Game where players are offered a cash prize which they can either accept and have instantly credited to their account, or decline. Introductory bonuses including $12 Freebie available until September 18, 2017. 23X wagering requirement, 8X max. cash-out (VIPs 15X). 13X wagering requirement; valid for all slots and progressive jackpot games. 10X wagering requirement; valid for all games. Now with more than 60 unique slot games, Slotland is popular with online casino players all over the world and is well-known for its excellent customer service.